It’s hard to imagine what Plaza de la Encarnación would’ve looked like years ago when there weren’t six giant mushroom shaped parasols rising above the busy plaza, before it became home to the largest wooden structure in the world. Plaza de la Encarnación was the setting of a food market (the same one there today in fact) but in 1973 when their facilities needed improvement and there was talk of incorporating an underground parking space into the same area, the stalls were knocked down. An above ground parking lot temporarily inhabited the plaza until a clear building plan was made to integrate a new market, underground parking and Roman ruins, which had been discovered in the 1990s. This ancient Roman colony was said to consist of ”structures including two Late Antique houses with courtyards, a possible church, and other houses or structures in the vicinity of a later Islamic house.” The structure was designed in 2007 by German architect Jürgen Mayer H and construction began soon after. It’s easy to tilt your head and imagine you’re seeing a large honeycombed spaceship descending upon Sevilla, but the structure actually includes four useable levels. The first level (below ground) was designed so you can walk around the excavated Roman ruins and the second street-level view includes a large farmer’s market along with a couple cafes. The third level, a raised platform below the structure, is a beautiful open space where you can really take in the massive size of the structure. The fourth level is my favorite. 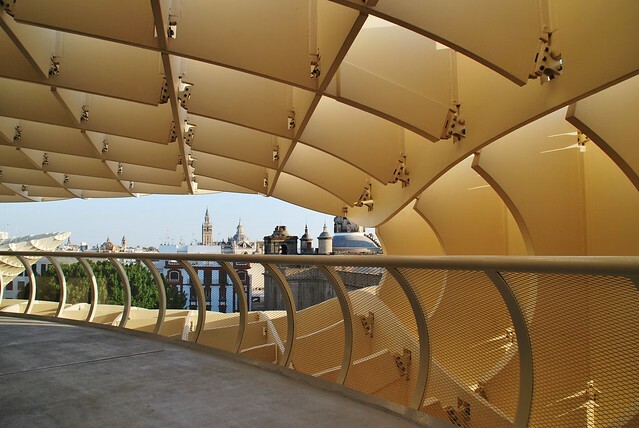 On the very top of the Metropol Parasol they have created a large panoramic deck to see the unforgettable views over the ancient city center. Although this plaza has been open since March 27, 2011, opinions still remain divided about the structure. As someone who has no roots in Seville, I tend to have a little different perspective. 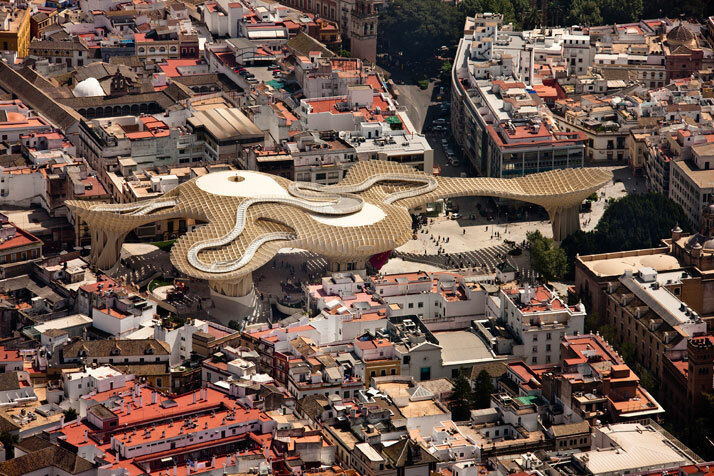 The Metropol Parasol is a (large) hint of the new in a city that steadfastly and so beautifully preserves the traditional. To some it looks out of place, a towering behemoth of light wood next to the muted Medieval tones of the cathedrals, cobblestone streets and apartment buildings. But to me, this modern structure represents that young, vibrant, you-can’t-quite-place-it feel of Seville. For a city that has seen the Phoenicians, the Roman Empire, the Arabs and all the diverse history since, it easily preserves all that traditional quality and feel, without being, well, boring. There is a deep history here that I can’t fathom having grown up in the U.S. Visions of a 7-year-old me running through Colonial Williamsburg in a mop cap and pinafore thinking I was in really old, ancient times comes to mind…But now I’m walking over Roman ruins every day. Plaza de la Encarnación is hugged by the old and traditional, but confidently represents that fresh, dynamic feel of Sevilla that you’ll never forget.